We were recently turned on to Team Viewer through the power of the Google Search Engines. The long and short of it is that we had need to help a friend having some computer issues; among these issues, an inability to use remote assistance and/or remote desktop. 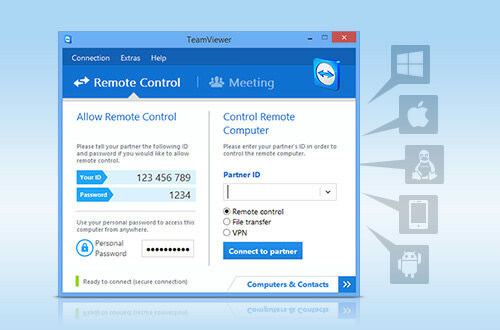 Team Viewer can connect to almost any PC regardless of location, Local Domain or operating system. It uses a unique number applied to the computer, instead of relying on an IP address. Users on both ends have control over access, so there is no worry of someone taking over your machine. Along with the Remote Desktop functionality, you may transmit video from a webcam and or voice, allowing you to communicate via VOIP technologies. Presentations: Transmit your whole desktop or just a specific window to users to watch. VPN: Allows computers to act as though they are within the same Local Area Network. File Transfers: You got it, quickly share files between machines, no more failed emails.